It's true. Nate Berkus rejected me. Not me but my couch. In November, I wrote to The Nate Show about my couch. The Nate Show was asking about what's in your house that you hate. The couch came to mind immediately. It's old covered in a floral pink, mauve and blue fabric that will never wear out. My daughter-in-law says it looks like a grandma couch and I'm not a grandma. The cats have tried to sharpen their claws on it, and the fabric doesn't even shred. It has survived three boys who turned into men. In January, Jon from the Nate Show called me. I let it go on the answering machine because I was sure someone (I won't mention names just initials P.V.) was pranking me. I called back ready to play along and then laugh. Only! It wasn't a prank call! The Nate Show did think my couch was ugly and outdated and would I mind if they destroyed it if I were selected. I responded, "Can I light the match?" So I've been waiting for them to call back and say, "Pack your bags, you're going to New York to destroy your couch." Oh the dreams I've had! From Nate being shocked at the state of my living room and sweeping in for a clandestine make-over, to a new couch, to a gift card. A chance to go to New York City and maybe a visit to Mood fabrics and the button store. This week I watched in utter despair as the Demo or Reno show aired, without me or the ugly couch. Heartbroken, I watched while curled under a blanket on my ugly couch as other furniture was renovated with beautiful fabric picked by Nate. The sadness almost had me searching for the chocolate chip bag--almost. Then I thought about it a little longer. I have a couch and a house to put it in. Some people don't. I can live with this couch a little longer. I'll get over Nate's rejection--someday. For awhile though, it was a nice dream. New York and the Nate Berkus show. Life would have been grand. If you want to see who did get to go it's on The Nate Berkus Show website. Meanwhile, I'm going to be looking at books like this to see if I can recover it or make slipcovers from drop cloths to hide it's majestic garden themed fabric. 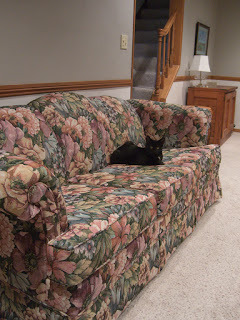 * Because there have been requests here is a photo of the couch. **Please don't be offended if you own a couch like this. This just doesn't work for me anymore. That couch hurts my eyes. Maybe when you said you'd want to hold the match they thought you were a pyro and decided to let you stay home? You could really play the psycho and destroy your couch on video in your back yard and send it to them. Or you could start mailing them pieces of the couch with letters (words cut out of magazines of course) saying what you would do to the couch if they didn't bring you to NY. Thank you Casey. I'm thinking of having Ed drive the bobcat over it and then I can burn it. Youtube it and who knows...then again crazy people might call asking me to help them remove their furniture.